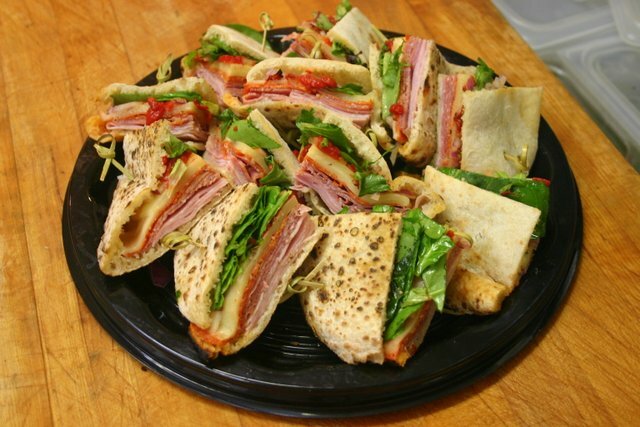 Puccia Sandwiches made on house baked bread then toasted in the wood oven, in the style of Puglia, Italy. Served with Pickle spear and choice of dressings. Platters also available! Marinara:, Italian Sausage, Garlic Roasted Chicken or Meat Balls with Marinara, Mozz, Parm. Philly Chicken Cheesesteak: Garlic Roast Chicken, Roasted Bell Peppers, Onion, Marinara, Provolone. BBQ Pork: Slow Braised Pork Shoulder in BBQ Sauce, Caramelized Onions, Melted Cheddar. 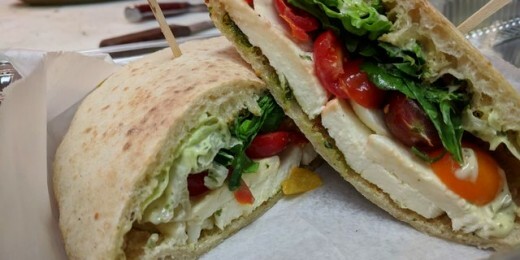 Chicken Pesto: Garlic Roasted Chicken Breast, Heirloom Tomatoes, Parm, Asiago, Pecorino Romano, Fresh Greens, Basil Pesto Aioli. Buffalo Chicken: Melted Gorgonzola, Fresh Greens, Ranch Dressing. 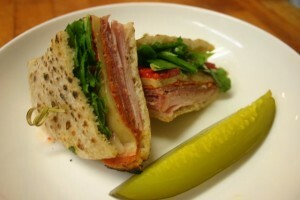 Ham and Cheese: Provolone, Cheddar or Mozz, Tomatoes, Greens, Mayo or Dijon. Caprese: Fresh Mozz, Heirloom Tomatoes, Greens, Fresh Basil, House Made Pesto. 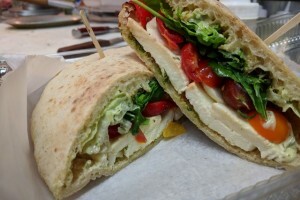 Choice of dressings: House Basil Pesto Aioli, Pesto, Mayo, Chipotle Mayo, Dijon, Spanish Sherry Wine Vinaigrette, Red Wine Vinaigrette, Ranch, EVOO, EVOO with Fresh Lemon.